Drawing on our more than fifteen-year experience in designing and manufacturing of power ultrasonic equipment and basing on recomendations of technologists and medical professionals we have created ultrasonic bath of higher reliability with full control service. Bath is designed for fast and qualitative cleaning of details and pre-sterilization cleaning of medical instruments. 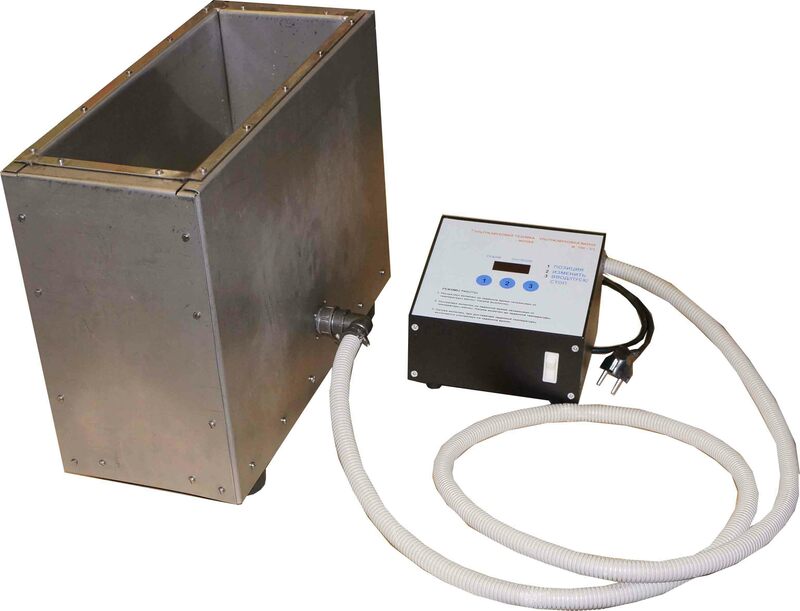 Bath is made of stainless steel, its volume is 14 liters, and its working frequency is 22 kHz that advantageously differs from analogs, as using of higher working frequency leads to less effective cleaning. Following to users of different ultrasonic baths advices we have separated block of ultrasonic bath with block of ultrasonic generator and controller. Due to this technical solution possibility of water putting to bath electronics is completely excluded. This advantages our bath from all ultrasonic baths, in which electronics places in single frame with bath. Bath is supplied with two ultrasonic transducers in order to create uniform ultrasonic field in all bath volume. Ultrasonic transducers are feed by electrical power 300 W. For improving all cleaning parameters frequency modulation of ultrasonic generator working is used. Frequency modulation of ultrasonic generator working leads to amplitude modulation of cavitation at bath - this strongly improves cleaning and removing of dirtying from object, including from inside and ulterior cavities. All discussed above allow considering possibility of qualitative pre-sterilization cleaning in short terms. Operation by timer with switching on of heating without waiting of assigned temperature level of working liquid. Temperature-controlled operation mode. Thick-film heater with up to 3 kW power and heating-element made of stainless steel quickly heats working liquid (water) to assigned temperature up to +99°C with keeping at assigned level to within ±0.5°C, and after that ultrasound switches on by timer. The set I100-3/1 consists of bath and block of ultrasonic generator with controller. Optionally: lid, insert basket, draw-off tap. operation up to 300 W.
3. Operating frequency of acoustic system - 22 kHz. New! Indicator of frequency and sound pressure in ultrasonic band in liquid medium.Unit allows indicating presence of ultrasonic oscillations in liquid medium in 100-99000 Hz band and estimating sound pressure induced in medium.